The Livestrong LS8.0E elliptical is a silky smooth riding cardio trainer with a large 20" stride, a length not found on many sub-$1000 machines, and it is the heaviest elliptical in its price class. 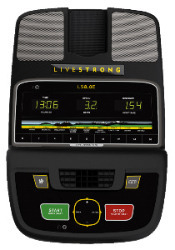 The Livestrong LS8.0E elliptical has LED display windows showing readouts for time and distance. There are nine training program offering a variety of challenging routines including Muscle Toner, Lance’s Climb, Mellow Johnny’s Trail, and more. Unit Weight/Dimensions — 192 lbs; 76" x 24" x 67"
The front-drive Livestrong LS8.0E elliptical trainer offers SmoothStride™ pedal cushioning and 0" Q-factor spacing. The pedals actually overlap, that’s how it achieves the 0" pedal spacing between the footpads; the narrowness is designed to decrease stress on the hips and lower back. A lever for the manual incline ramp adjustment is located at the base of the console unit and offers five heights to target different leg muscles. Simply lift and pull the lever handle to set the incline to your desired level. The Livestrong LS8.0E has a SixStar Certification™ frame to provide proper body alignment and a naturally comfortable elliptical stride. This covers six key elements including a flat ellipse natural foot path to mimic a natural walking motion and minimize fatigue, zero gap on the pedal spacing, ideal fit handlebar placements to eliminate overreaching, straight up body posture positioning, sure step low pedal placement for easy mounting and dismounting, and a large flywheel for smooth pulley operation. Since there aren’t many elliptical reviews on this model yet, we can make a few observations as to its design. First of all, the budget-priced Livestrong LS8.0E trainer has the advanced features of a much more expensive model, including a large 23-lb flywheel, a 20" stride, dual action handlebars for upper body workout, and a solid non-wobble 192-lb frame. No other elliptical trainer at this price can match the specifications of the LS8.9E, since most have only 14-lb flywheels, 16" to 18" strides, and weigh less than 140 pounds. Even the in-home service warranty on this budget Livestrong is for one year while competitors only offer 90 days labor. New for 2011, the Livestrong LS8.0E has the same frame and specs as the more expensive 10.0E and 13.0E models but with fewer snazzy features. The rear-drive Yowza Largo (18" stride length) and this front-drive Livestrong are the two best choices at the $800 price point now that Spirit Esprit models have seen a big price jump. 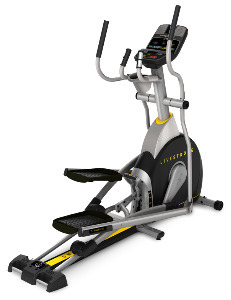 Overall, the Livestrong LS8.0E elliptical is an excellent value at $799.